Robotic Process Automation (RPA) is the equivalent to employing superman in your workforce. Software bots are developed to automate manual & repetitive tasks and also to complete the tasks in the minimum time. This results in, reduced cost of operations, elimination of human errors and greatly improved quality. The end goal is for smooth-running of your business and provide the highest quality customer experience. RPA is a technology, which allows software robots to replicate the manual work done by humans. This could range from configuring existing software while ensuring existing systems are not disturbed, to capturing and understanding application processes, manipulating data, creating communication channels with other systems and so on. Once the RPA software is programmed to understand specific processes, after that it can automatically process data, manipulate data, trigger responses and communicate with other systems as and when required. Rule-based processes can also be easily re-configured because RPA is basically code-free and does not require critical programming skills to modify the precoded bots. Business process automation (BPA), also known as business automation or digital transformation, is the automation of complex business processes using technology. It can provide a business for simplicity, achieve digital transformation, increase service quality, improve service delivery or contain costs. Enterprise resource planning is an efficient tool that manages all your business processes easily with precision and agility. Our robotic process automation software intelligently automates functionality inside of your ERP system. We can automate the processes and most time consuming tasks in leading ERPs such as Oracle, SAP, and other platforms. Automated data entry systems are capable of reading information from a complicated data access sources like PDF files, emails, websites and insert the data into a more adapted data storage. The main goal of data entry software is to replace or streamline a workflow, which is usually performed by a human with a fully or partially automated process. Nowadays businesses and applications are widely running on web-based systems. Many of the tasks involved are repetitive, boring, time and money consuming. For example form filling, screen scraping, data extraction and transfer data between applications, website testing and periodical report generation are major common tasks, which can quickly be automated using RPA technology. Chatbots are actually used for customer support and lead generation. Integrating AI-powered Chatbot into customer support, marketing and sales tools can reduce human efforts. With the help of natural language processing (NLP) technique, automated bots can understand human messages more easily and respond to customer needs in quick manner. Sales order processing is attached to customer service and supply chain processes. The cost of human errors can even lead to the height of losing customers. That's where Teplar comes in. With our automated order processing RPA technology, users can process, track and archive any order in your existing ERP system. 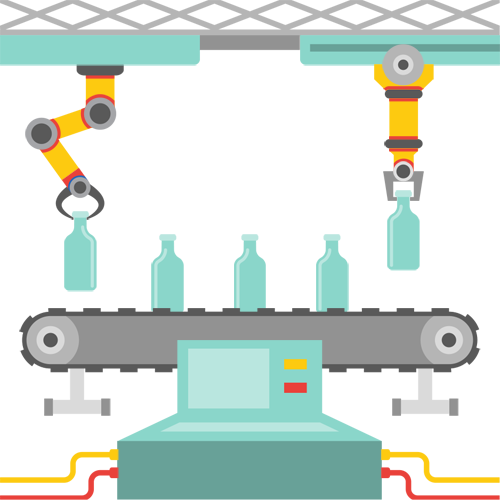 An inventory management automated using RPA can monitor inventory, generate notifications based on minimum stock, maximum stock, reorder levels, and can automatically trigger purchase requisition or production order once the inventory reaches the reorder levels. RPA helps determine inventory levels based on past inventory turnover and patterns in demand. Robotic process automation is the use of software script with artificial intelligence and machine learning capabilities to handle high-volume, repeatable tasks that previously required humans to perform. These tasks can include queries, calculations and maintenance of records and other transactions. Why TEPLAR for RPA Development?